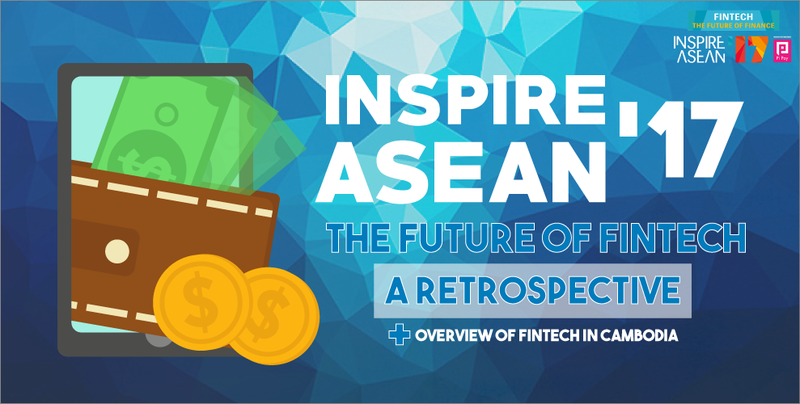 Inspire Asean hit the Kingdom once again by gathering some of Southeast Asia’s (SEA) leading voices in finance for another exciting round of informative Fintech-related talks, where they were able to share their invaluable knowledge. The event, held at the Hotel Sofitel Phnom Penh Phokeethra on 29 September, explored the rapidly growing trend of technology in the financial sector prevalent in the region. Deputy General Manager of UnionPay International SEA, Vincent Ling, highlighted that over 264 million people in the SEA region do not have bank accounts and that comprises just under half of SEA’s total population. However, as mentioned by various speakers at the Inspire Asean event, this is not a downside, but rather an aspect that further encourages Fintech firms to find more ways to penetrate untapped markets, like Cambodia for example. Speaker Hong Samarkkeenich, Regional Sales Director of Lenddo, a Philippines-based startup now based in Singapore that uses social media to assess customers’ financial stability; mentioned the importance of big data and financial inclusivity. At the moment, Hong feels that Cambodia is making its way to its digitisation stage; though its banking sector may be progressing slowly. “Many underserved people are coming online,” she mentioned before urging financial institutions to embrace the potential of untapped markets. Going deeper into Cambodia’s Fintech scene, many investors feel that starting a Fintech-related venture here is something of high risk with only 20% of Cambodians owning a bank account. CEO of Pi Pay, Tomas Pokorny shares in regards to the prospect of Cambodia developing a digitised economy, “Everyone keeps saying that Cambodia is not ready. This makes me sad.”. He continues to say that despite only 20% of the population utilising bank accounts, he sees “an opportunity for the other 80%”. Pokorny is not the only one who is determined to defeat the odds and seize the bustling opportunities here in Cambodia. Speaker, Brad Jones, CEO of Myanmar-based WaveMoney, agrees that developing markets like Cambodia are ripe for innovative Fintech ventures; explaining that though cash dominates here, Cambodia remains a significant market and it is “a great market to try out new things and see how they work”. Another speaker, Sim Chankiriroth, founder and CEO of Banhji also sees Cambodia as a place full of potential. With the relevant infrastructure and talent already set in place, all that needs to be done is for investors to act upon this opportunity at hand and put the industry on a regional stage. He goes on to say that the focus on Fintech in the Kingdom can boost the economy massively by driving over $2.4 billion into the system. 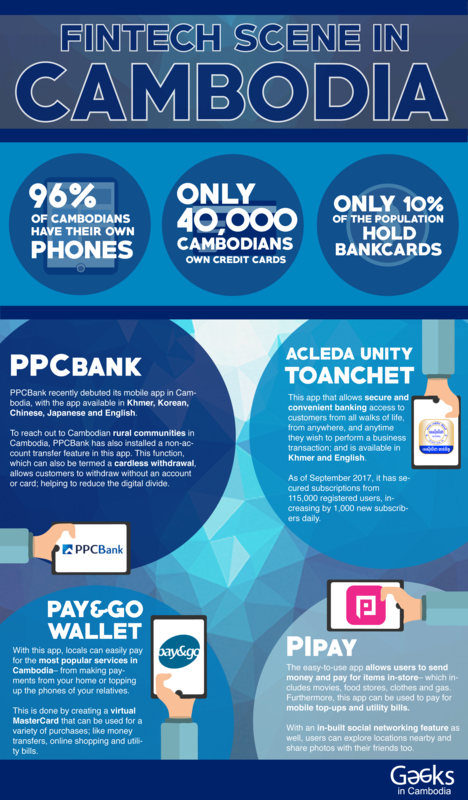 With this, the potential for Fintech to grow in Cambodia is extremely apparent, as seen from the experts themselves. Despite the negative presuppositions of investing Fintech here, there has recently been various Fintech-related mobile applications and platforms popping up in the Kingdom, offering a plethora of services from digital wallets to mobile banking services. Steve Miller, Founder of CryptoAsia, a growing Phnom Penh-based Bitcoin startup, further says that more rural populations in countries like Cambodia and Myanmar are often neglected by business institutions and their lack of documentation makes it difficult to open a bank account. Referencing this situation, Miller feels that users should just skip the middle steps and jump straight into cryptocurrency. “You can literally download a bank… All you need is an app,” said Miller, emphasising that the right Fintech tools can create a system that is financially inclusive of all sectors of society, without the need to set up a conventional bank account. Whilst the prevalent challenges of Fintech in the SEA region, this year’s Inspire Asean event served as a reminder of the region’s untapped potential, showing that the future of Fintech for both the SEA region and Cambodia looks significantly bright. Though countries like Cambodia have a long way to go before achieving ultimate Fintech hub status like Singapore and Hong Kong, it is still an area flourishing with potential and should definitely be a viable option to financial investors! If you want to find out more about the event, do check out their website here as well.